As per the bond introduced by the Tamil Nadu, a candidate opting for courses at medical colleges is liable to execute a Bond for serving a period of 10 years and failure to abide it would entail a penalty of Rs.2 crore. According to the bond conditions of other states, a doctor is supposed to serve for a period of 3 years in the rural and difficult areas, where there is no basis facility provided to practice. 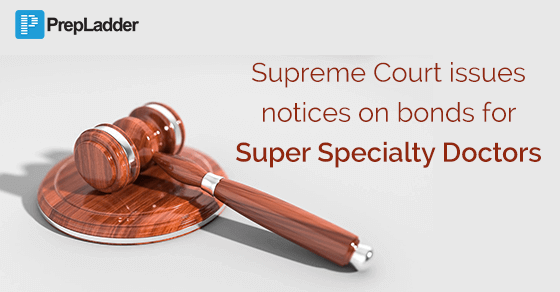 On the plea by doctors, the Supreme Court on Tuesday issued a notice to the centre, Medical Council of India and others, challenging the mandatory service bond or penalty introduced by the state governments for pursuing super specialty courses. A bench of Justices S A Bobde and L Nageswara Rao admitted the petition filed by over 100 PG doctors along with “Association of Medical Super Specialty Aspirants & Residents” for consideration as they allege that such conditions were strict, unreasonable, harsh and cruel. Senior advocate Amrendra Sharan, appearing for the doctors, said several states have introduced a bond system at the time of admission under which an aspirant has to remain in service for 10 years and if they break the bond, they have to pay Rs. 2 crore as penalty. He said that the bond system introduced by 12 states was in contravention to the apex court’s earlier verdict, which said that only merit should be the criteria for enrolment to the super specialty courses. Calling the bond system as biased, Sharan said it went against the existing law and the court will have to decide the issue. The bench said that it would look into the matter and sought responses from Centre, MCI and state governments. The super specialty course aspirants had claimed that due to the bond conditions in various states, doctors have not joined the courses last year, entailing a huge loss to the public asset.